Is your home cold in the winter? Do you put plastic on your windows to keep the heat inside? There’s a better way to survive Wisconsin’s winters. The Social Development Commission’s (SDC) weatherization team can help. If you qualify for Milwaukee County’s energy assistance program, you may qualify for SDC’s Weatherization services. SDC’s energy auditors can help you make your home more energy-efficient, whether you rent or own. Wondering if your furnace will make it through another winter? 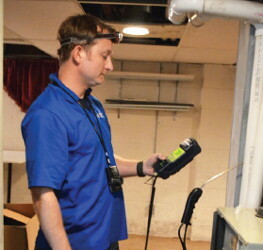 Have a SDC energy auditor check it out. The Weatherization Assistance program is a federally funded program that assists low-income families. Through weatherization improvements and upgrades, these households save on average $283 or more every year, according to a national evaluation of the program. Low-income households typically spend 16.3 percent of their total annual income versus 3.5 percent for other households (2014 ORNL study). Often, they must cut back on healthcare, medicine, groceries, and childcare to pay their energy bills. Weatherization helps alleviate this heavy energy burden through cost-effective building shell improvements such as insulation and air sealing, heating, ventilation, and air conditioning systems, lighting, and appliances. The program improves health and safety by eliminating any energy-related hazards. Once installed, energy- efficient weatherization measures continue to save money and energy year after year and increase household incomes so funds can go towards key living expenses.